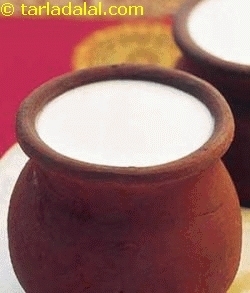 Curd has a special place on the plate and palate of India. No Indian meal is complete without some form of dahi showing up on the table. The product of the lactic fermentation of milk, curd is esteemed for both its smoothness and refreshing taste. The glycemic index of curd is 28 and its glycemic load is 2.8. Lactose intolerant people lacks the enzyme lactase found in the small intestine which breakdown lactose into glucose and galactose. Curd is suitable for people with lactose intolerance because they contain probiotics which has the enzyme lactase and aids in easy breakdown of lactose. Is curd safe for diabetics? The glycemic index of curd is 28. This is best understood by the glycemic load which is around 2.8 for 1 cup of curd due to 10 grams of carbohydrate within it. Your diabetic meal plan should consist of 45 to 60 grams of carbohydrates per meal. The carbohydrate content should not exceed per meal so that the blood glucose levels remains stable. To keep your carbohydrate count within the limit, try incorporating curd with more of complex carbohydrates such as whole grains which adds more nutritional value to your meal rather than adding simple sugar in it. Curd is extremely a rich source of calcium which helps in improving your insulin sensitivity. Curd being low in carbohydrates, tend to slow down the absorption of the nutrients and manages your blood sugar levels. Curd also contains probiotics which keeps your gut and digestive tract healthy. The probiotics are healthy bacteria which helps in improving insulin functioning. It also helps in maintaining your blood pressure due to its low sodium and high potassium content. Is curd suitable for weight loss? 1 cup of curd provides 234 calories. Curd is rich in protein which is more satiating and filling compared to both carbohydrate and fat rich meal providing same amount of calories. Try eating your curd as a snack or in your breakfast or lunch which will help you eat lesser calories and makes you feel fuller for a longer of time. The recommended calcium intake for a normal adult is 600-800 mg. 1 cup of curd provides 210 mg of calcium meeting 1/3rd of the requirement. Calcium is known to be effective in stimulating breakdown of fat and boost your overall metabolism. When on a weight loss diet, try to have a low fat curd which is low in calories with all other nutritional value incorporated in it. Opt for curd over high calorie foods with no such nutritional importance.